A beautiful Pandora sphinx moth (Eumorpha pandorus). Because of its large size (wingspans can reach up to 4.5 inches), the moth was easily spotted by a Bryant Park Corporation staff member as it lingered on a wooden surface near the northwest corner of the park. 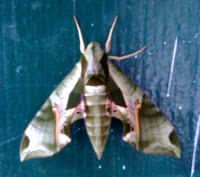 The topside of the moth is colored with many shades of green, including darker patches on the head and wings, and a few pink streaks on the wings. The underside is typically yellow or light brown. In this region, adult Pandora sphinx moths can be spotted flying during dusk from June through August. The species remains dormant throughout the winter months, spending its pupal stage burrowed beneath the soil.